I've been playing around with my commercial Sun Oven to see if I can "turbo" it's performance and make it usable in Winter, when I saw one of the pictures featured on your site. 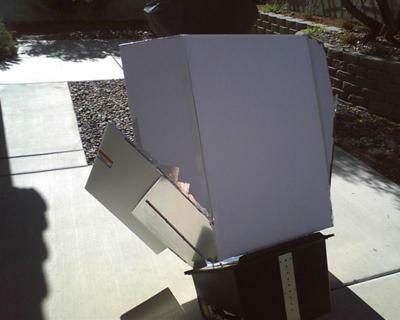 Since I'm a big fan of the All Seasons Solar Cooker, and have made four of them with various materials (matboard, foam board, cardboard), I recognized the foam board used in the picture and ran out to my sun oven with an idea. I constructed a simple insert, consisting of three aluminum covered, foam boards. The reflecting material is an aluminum foil tape called "Shurtape AF 912" which you'll find in the tape area at Lowe's. Runs about $7-8 a roll. I learned about this tape from the ASSC instructions from your site. I needed a half of a roll to cover all of the panels. The two side panels are 20" x 30", and they are attached to a larger center foam board which is slant cut to "joint" to the side boards. 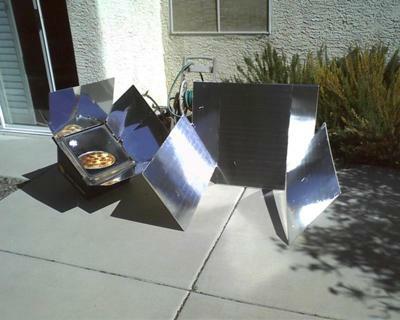 The side boards slip into the sun oven's own joined sections, and the center piece is behind the center reflector. Nothing is fastened to the sun oven. The insert just slips on and off, and doesn't get taken off by light winds. I've effectively taken the 1320 square inches of reflector that comes with the sun oven, and taken it to just over 2500 square inches. My sun oven, normally 300F this time of year, got to over 410F before I slipped a frozen pizza inside of it (to help cool it down). A frozen pizza cooked thoroughly after only 40 minutes. The insert also fits around the All Seasons Solar Cookers I've built over the past few months. Thought you'd enjoy the pictures. I'll be cooking now, all year round, with the oven and this insert. Normally I can cook at 250-300F in the Vegas Valley, at this time of year. I can easily get another 100-150F with this insert. I should have done this years ago. The reason the ability to "turbo" your sun oven matters, is that many people find their limited Winter sun, or year round time restrictions a barrier to cooking year round. They want their oven to get up to temperature fast, or at least achieve a solid cooking temperature in less than ideal conditions. The sun oven is a great product, but they have chosen to limit the panel reflector size and not offer an add-on kit. I've written to Paul Munsen at Sun Oven International and shown him my pictures. Eventually the idea of an after market product may make sense to his company, but right now, I need it, so I made it. Took me a few hours, and less than a ten dollar bill. Hope this inspires others. Thank you very much Brad for your insights as well as the results with your "modifications" to your Sun Oven. I agree with you and Chris in regards to the necessity of having more flexibility as well as cooking potency from the venerable Sun Oven. 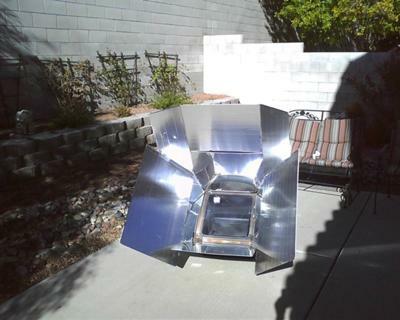 Good idea; "aftermarket" additions for solar cookers of all types. Your submission should also inspire others to do as you have with your cookers. I used the insert again, and reached well over 400F in January (outside temp in the upper 60's in Vegas). As I was fiddling with it, I realized that I could easily gain another 15-50F with a better insert design, so I'll be doing that, and posting the results. I did catch a huge wind the other day, and tipped over my sun oven (without food in it, thank goodness). The simple remedy was to clamp binder clips onto the back of the oven's wooden frame, and then fill two plastic bags with rocks, placing them on each corner, held in place by the clips. No problems after that. Two other modifications shared with me are to install a wing nut onto the inner oven's swing arms when you want the arm to stay in place (like when you're pouring something into a container already in the oven). The other is to drill another hole in the gimbal positioner, so that the adjustment pole can extend another notch during low winter sun angles.